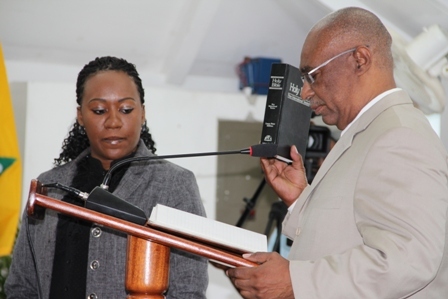 NIA CHARLESTOWN NEVIS (April 29, 2013) —President of the Nevis Island Assembly Hon. Farrell Smithen welcomed the members of the Opposition at a sitting of the Assembly in a statement on April 26, 2013. 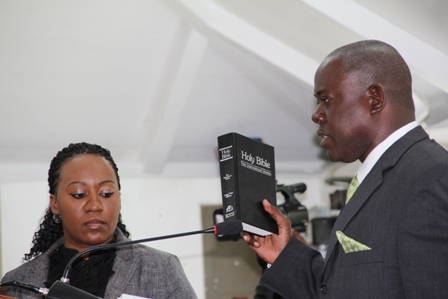 The Sitting was held for the delivery of the 2013 Budget Address by Premier and Minister of Finance in the Nevis Island Administration (NIA) Hon. Vance Amory. Leader of the Opposition Hon. Joseph Parry, Hon. Robelto Hector and Hon Carlisle Powell took their oaths from Clerk of the Assembly Ms. Shemica Maloney before President Smithen. 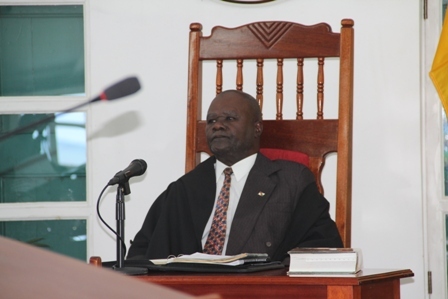 “I am pleased to see the balance in the House, that is, the members opposite and the government side and I am quite certain that the Nevisian public is pleased to see that the House is well constituted and I crave your indulgence in ensuring that it stays that way for a very long time,” he said. Meantime, the President used the opportunity to reiterate his stance against the use of what he termed un-parliamentary language. “During the opening of Parliament, I made a few announcements, in that, it was my view that as the President of this Chamber and this Assembly, there is need for us to, as it were tone down some of the rhetoric we do have sometimes and that we should in fact respect each and everyone. “I do so because at the opening we did not have the members opposite and so I felt it was just right that I say it today that we need to ensure, that we do respect each other and that certain languages that are not parliamentary language will not be tolerated in the House. As time goes by I would have more to say on that,” he said. The Assembly President also spoke of the new accommodations made for parliamentarians and thanked those who were responsible for the upgrade. “I am certain that those of you seated in the gallery would realise that we have a change in the seating accommodation here in the chamber and I wish at this point to thank the persons who in fact instituted the change because it is in my view a welcome change. 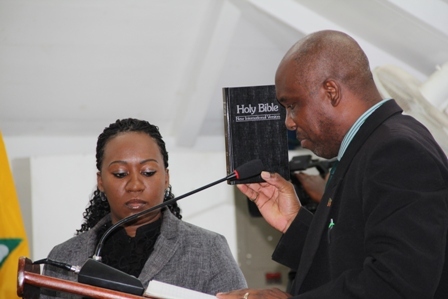 “It shows therefore, that if we work together, we would succeed and it is my intention to ensure that we work together for the benefit of our island, Nevis,” he said. The House of Assembly was later adjourned and resumed for debate on April 29-30, 2013.